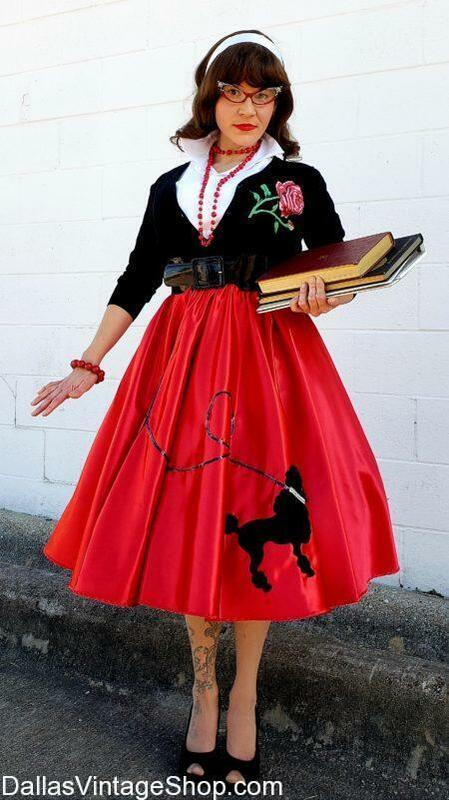 You have to see our 50’s ‘Top of the Class,’ High Quality Poodle Skirts. We have all the 50’s Clothing & Quality Accessories for any 50’s Sock Hop Costumes, School Girl Period Attire, Prim & Proper Fifties Ladies, 50’s Classic Rock and Roll Dance Parties, 50’s Vintage Auto Show Models, 50’s Broadway Musicals & Theatrical Costumes, 50’s Hollywood Movie Stars, 50’s Genre TV & Movie Characters Costumes, 50’s Classic Movie Actress & Actors Outfits, 50’s Historical Characters Period Costumes 50’s School Project Costumes and more. Get all the 50’s Costume Accessories for any 50’s Outfit we sell from 1950’s Gala Attire to 50’s Teenyboppers. We have all the 50’s Hairdo Wigs, Cat Eye 50’s Style Glasses, 50’s Peep Toe Shoes, 50’s Casual Jewelry or Gala Rhinestone & Pearl Necklaces, Bracelets and Earrings, Saddle Shoes, Poodle Scarves & Socks, Poodle Skirts and 50’s Quality Vintage or Reproduction Fuzzy, Soft Sweaters and so much more. Get High Quality, Elaborate Outfits or Median & Economy Priced Costumes & Accessories. Get Entire Theatrical Wardrobes, One Complete Outfit or just the Pieces you need. We are open all year and we have the largest and most comprehensive collection of 50’s Vintage Attire, 50’s Retro Clothing, 50’s Reproduction Clothing, 50’s Costumes & Accessories in the Dallas, DFW Area. This entry is filed under 1950s Ladies. You can follow any responses to this entry through the RSS 2.0 feed. Both comments and pings are currently closed.